“Designing Fabric Interactions” (DeFInt) is my master’s thesis work at Media Lab Helsinki. 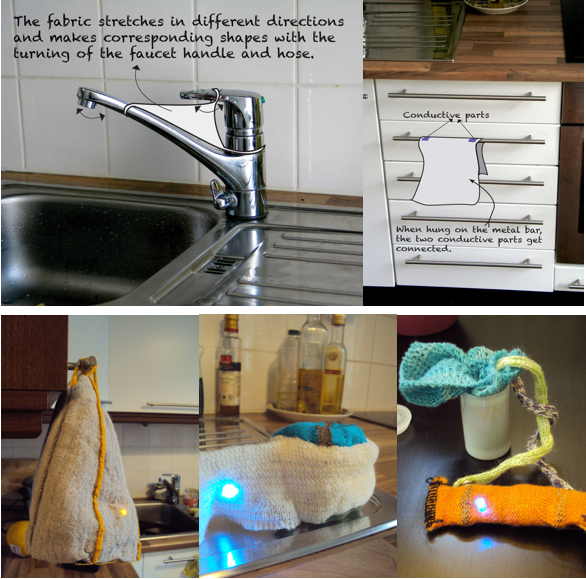 DeFInt is a series of e-textile interface elements that explore different methods of integrating knitted fabrics with basic electronics. The project aspires to investigate the existing interactions and our material understanding of fabrics to find opportunities for creating interesting and fun interfaces. The process involved working and experimenting with knitting yarns, conductive threads and off-the-shelf electronics while using traditional fabric construction tools like knitting and sewing machines. Using a material-driven approach, a collection of single instances of fabric interactions or “soft triggers” that explicitly interpret fabric related actions as inputs were prototyped. These soft triggers were designed to essentially work with physical properties such as conductivity or shape of the other objects as a way of creating an immediate relation between the user, the soft trigger and their surroundings. The first part of the video demonstrates how the fabric interface is connected to the Lilypad. Kindly skip ahead to 1:38 min to see the shape sensing demo. Other “soft trigger” videos can be found ‘here‘. The focus of this project was to specifically use the familiar “language” of fabrics to create novel experiences and interactions in our everyday scenarios. Following the approach of ludic design (by William Gaver), this work also emphasises the potential of e-textile interfaces to invite unexpected interpretations and responses from the users while enabling an active, creative relationship with their surroundings.